It is a real magic triangle the one that imaginarily unites the three art temples of Madrid . At the vertex: the legendary Museo del Prado. At the other two corners: the Thyssen Bornemisza and the Centro de Arte Reina Sofia. Visiting any of them guarantees an unforgettable walk through the arts. However, the Madrilean art patrimony is not only composed by these three institutions, but it also entails a large series of rich and interesting museums. 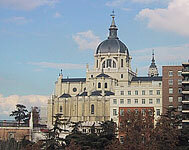 Originally a natural history museum, the Museo del Prado became an art gallery in 1819. Inside the more than one hundred rooms of this neoclassical palace are housed hundreds of authentic masterpieces of European painting. The largest collection of Spanish paintings revolves around three absolute masters: Goya, Velazquez, and El Greco. Very well represented are also the Italian and Flemish masters, from which the rich collection of Tiziano and Masterpieces of Rubens stand out. It is very hard to limit the visit to just a few rooms, but if you have limited time we would like to highlight the absolute must-sees of the collection: The "Annunciazione" by Beato Angelico, the "Ritratto di Cardinale" by Raffaello, "Le tre Grazie" by Rubens, "Las Meninas" by Velazquez, and "Maya desnuda" and "Maya vestida" by Francisco Goya. Inaugurated during the nineties inside the walls of the neoclassic Palacio de Villahermosa, the Museo Thyssen Bornemisza offers to the public more than 800 works of art -paintings and sculptures- that belong to the rich collection that the magnate of the same name donated to the city. Its rooms tell the story of western art going from primitive Italian artists through the German renaissance, the Russian Impressionism and Constructivism all the way to Abstractism and Pop Art. Another museum that recently opened its doors (1992) is the Museo Nacional Centro de Arte Reina Sofia . This 5 story building, a former hospital converted into a museum, dedicates two floors to a permanent collection of contemporary Spanish art and the other three to temporary exhibitions. Needless to say, the museum's most prominent masterpiece is the " Guernica " by Picasso, but we would like to emphasize that the genius of Malaga is not the only "master" of Spanish art featured in the collection. On the second and third floor there are remarkable works of art by Savador Dali and Joan Miró. In the vicinity of the Puerta de Alcalá, this museum probably features the most comprehensive archaeological exhibition of the country. Divided into almost 40 rooms, the visitors engage on an ideal trip to the discovery of the civilizations that have populated the Iberian Peninsula since its origins. Divided into three floors of the prestigious residence of the Marques de Cerralbo, the museum contains the rich collection donated by this nobleman to the State. 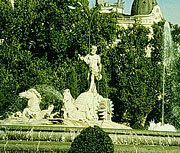 Of interest: Porcelain and tapestry, antique armoury and furniture, and an interesting collection of Spanish paintings. The patrimony of this expository residence is constituted by the canvasses of great Spanish painters of the fifteenth and sixteenth hundreds such as Francisco Goya. There are also works by Italian, Flemish, and French painters. Inside the same building of the Calle Alcalá there is the Calcografia Nacional that houses thousands of drawings and engravings. Mayan and Aztec manuscripts, among others, can be found here in an exhibition that entails collections of ethnography and archaeology of the Americas . The best way to discover the history of the Spanish railways is to visit this museum that houses locomotives and carriages of various époques. This 4000 m2 museum tells the story of the Earth and mankind. With a history that goes beyond two centuries, this museum belongs to one of the oldest in Europe in this category.